Fisher has everything you could possibly want in a beach vacation home. Built in 2015, this Seven C’s condo utilizes serene décor, modern amenities and unobstructed ocean views to provide the ultimate relaxing atmosphere. 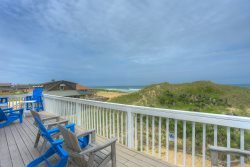 Located oceanfront at MP 7.3 in Kill Devil Hills, getting to the beach is as simple as walking across the complex boardwalk. Condo parking lot offers plenty of space for your vehicles and an elevator makes unloading a breeze. As you enter into the spacious condo with open-style floorplan, you’ll be greeted with bright, natural light from the front and rear windows. To your left, a dining area features an oblong table with room for 6 guests and the adjacent modern kitchen has stainless steel appliances and island bar with seating for 3. The sleek kitchen layout provides plenty of counter space for whipping up your favorite seafood dish. The heart of this home is the inviting living room area with ceiling fan, TV entertainment center and nautical decorations throughout. If you need more space for guests, the sofa converts to a Queen Sleeper Sofa. Best of all, there is a beautiful ocean view right through the sliding glass doors. Outside, you’ll love kicking back in the evening on your oceanfront deck as you watch the daylight fade into the starry night sky. You’ll rest easy in the King Master Bedroom with attached Master Bath complete with a TV for late-night movies, ceiling fan for optimum comfort, and stunning ocean views when you wake up. The other Queen Bedroom is just as cozy with TV, ceiling fan and access to Full Bathroom in the hall. A hall Laundry closet with Washer and Dryer is conveniently located between both bedrooms. Outside, spend the day lounging by the condo’s community pool or swimming a few laps. Outdoor shower facility is on-site and you’ll benefit from direct access to the beach via a wooden boardwalk. Need more than one unit? Additional Seaside Vacations homes in the same complex: TSC301, TSC305, TSC404 & TSC405. Booking Fisher not only means having a comfortable beach home but also being located in the middle of the OBX close to great restaurants, fun activities and other local attractions. If you have a foodie in your group, be sure to check out Outer Banks Brewing Station or Rooster’s Southern Kitchen for a tasty meal. For a quick lunch, Slice Pizzeria offers a great selection of different pizza pies and for dessert, you can pop over to the famous Duck Donuts in the same shopping center to enjoy a warm doughnut. For an outdoor adventure, head to Kitty Hawk Kites to try hang gliding, kite boarding, or other fun water sports. The Wright Brothers National Monument is also nearby for the history buffs in your group. If you love fishing, be sure to head over to T.W.’s Bait & Tackle to get some gear and head out on the beach or a local charter to try your hand at reeling in the big one. No matter which activities you choose to fill your vacation, you’ll be happy that you booked Fisher for your next trip. Our family had a fantastic experience at this home. It is clean, comfy and felt like home. The view was amazing and the neighbors were all very friendly and fun. If you have children they will be sure to meet friends and have a blast!! We will be back again for sure! We had a great time and thought the house was great! The house was clean, well kept, and close to the beach. We would definitely stay there again next summer. One of the best vacation rentals we have ever experienced. Clean, comfortable, and you can't beat the location! View from the deck was amazing! Watched dolphin swim by almost every day. Loved the keyless entry as we never had to worry about who had the key or losing it. Pool was exceptionally clean for being situated among the sand dunes. Ease of check in and out was an added plus. We would definitely recommend this rental. This is by far the best place I've have stayed. It suited my sister's needs since she is handicapped, and the views were beautiful. We got to see dolphins all week.